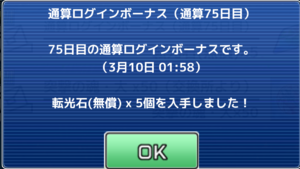 You must log-in every day to receive the full set of 7 login bonuses, after which it will reset to day 1. A new login day starts at 12AM in Japan, which is 10AM EST in the United States. At certain milestones, you'll receive extra items depending on how many times you've logged in. Forgetting a day doesn't reset this. This page was last edited on 30 November 2018, at 16:23.